Making Room is a three-year spiritual initiative that we began back in 2017 to challenge us to pray more boldly, to invite more intentionally and to give more sacrificially than ever before to advance God's mission together. It will also enable us to expand and update the LifeChange campus to take advantage of the unique position and opportunity God has set before us in our community. Click Here to submit your 2-year commitment to the MAKING ROOM initiative. Click Here to make a tax-deductible donation to the MAKING ROOM initiative. What do the facility plans include? In the first phase, we will construct a new (approx) 12,000 sq-ft facility which will house a state-of-the-art worship center and a spacious lobby with meeting areas and a cafe. In addition, the worship center can also serve as a carpeted, recreational gymnasium. The new facility will connect directly to both the old worship lobby and the old Kids Center, enabling total indoor access to those buildings. What opportunities would a gymnasium offer? In looking at the census data for our area, it was identified that recreation was a strong need in our area. However, when it comes to access to an indoor facility, there really weren’t any local options available. Several of our planning teams felt like offering our community a gym would be an excellent way for us to serve and connect with the needs of those outside the church. In addition, it could open up opportunities for moms with pre-school kids, as well as those who would like an indoor walking venue. For the initial phase, a multi-purpose worship center and gym is the most practical and cost effective way for us to do this. With special carpeting and sound barrier materials, the architects assured us that it would serve both functions well. How were the building concepts developed? Architects from Elevate Studio in Grand Rapids met with approximately 80 people from LifeChange who attended the congregational breakfast and workshop in Spring of 2016. From that event, they received much of the input and values that helped shape the concepts. In addition, 10 ministry teams of volunteers who serve in key areas (youth, kids, adult, facilities, hospitality, etc) each met in separate focus groups to offer more specific input to the architects. What do the upgrades to the children’s space include? Upgrading and expanding children’s ministry space was a high priority in the focus groups. 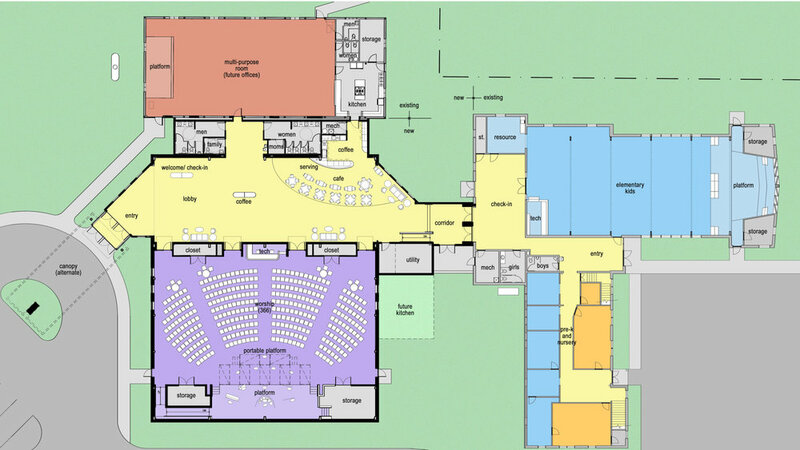 In this initial phase, we will 1) move all children’s ministries out of the basement; 2) utilize and upgrade our existing worship center space for elementary age kids; 3) upgrade and refresh our existing office and meeting space to accommodate nursery, toddler and pre-school ministries. This will allow all children to be in the same building which will enhance security and centralize our check-in to one area for all children. All kids ministry spaces will be connected (indoors) to the north our new lobby. Our existing offices will be relocated to the old Kids Center building. Our current design estimate is $2.5 million. This estimate has contingencies built-in. What role will the MAKING ROOM initiative play in funding? Our goal is to raise at least $800,000 during our three-year MAKING ROOM initiative to serve as a down payment. What are the other building phases? The other building phases are simply part of a larger master planning process to help us look at the long-term potential ministry opportunities of our facilities and land. Future phases will be considered only as God continues to bring resources and people to LifeChange. Should I direct my regular giving to the MAKING ROOM initiative? No. Your gift should be above and beyond your regular giving and tithing to our ongoing ministryand operational funds. Take time to prayerfully ask what gift God would want you to offer. That’s between you and God. Again, we are asking everyone to prayerfully consider giving that would involve sacrifice. Everyone’s amount will be different relative to their ability. Giving will not be the same for each person, but we would hope a level of sacrificial giving would be considered.